What runs on a PC, requires serious amounts of skill and generates enormous amounts of smoke and gore? Nope, we don't mean the latest first-person shooter. We're talking about a doctor simulator. Thanks to Suvranu De at the Rensselaer Polytechnic Institute in New York, surgeons can now accurately simulate those precious moments when they accidentally cut through the wrong bit and set the patient on fire. Speaking to New Scientist, De explains: "Intra-abdominal tissue has a very high density of blood vessels. When a cauterising device cuts it, copious amounts of smoke are generated and bleeding may occur. These effects are hard to incorporate in a simulation." De's solution? Pre-programmed visual effects that make the simulators much more realistic and which hopefully prepare surgeons for any eventuality. Remember the underwater Terminators in Rise of the Machines? Thanks to Professor Malcolm McIver, they might not be science fiction for much longer. Professor McIver's robot fish, Ghostbot, uses robotics to mimic the movements of real-life fish. The long-term plan is to develop incredibly manoeuvrable vehicles that are as agile as their aquatic inspiration. You'd think that with all the woes in the world, turning gold purple would be fairly low on scientists' to-do lists - but it turns out that messing with precious metals could help develop green energy sources. Professor Richard Watt and his students found that by mixing citric acid with a common protein, they could change gold powder's colour; doing that proved that there was a transfer of energy, which could be used to power a battery or fuel cell. Physorg.com reports that Professor Watt's family has form in this area: his father invented a fuel cell that ran on sugar and weedkiller. Good news for those of us who look at the sky and think "sheesh, what a mess!" - NASA may have found the answer to the orbiting junk left behind by countless satellite launches. 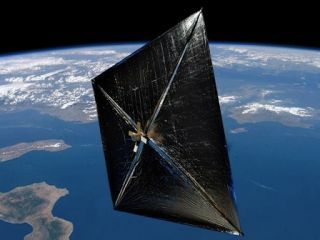 This week, NASA's NanoSail-D spacecraft unveiled a solar sail, which is used to propel it around the Earth as lead investigator Dean Alhorn cried "We're solar sailing!" Such sails could be fitted to satellites to stop them hanging around forever: when their time is up they'd unfurl their sail and let it drag them back to Earth. Blowing safes open with dynamite is so twentieth century. When Kyle Vogt wanted to know if an old safe contained "cool stuff like gold coins, ancient relics or even mummified body parts" the MIT student roped in a friend and built a safe cracking robot. Rather alarmingly, the resulting robot was able to crack a supposedly uncrackable lock, the S&G 8400. When Skynet finds out about this, we're in trouble.